Running a startup is like conducting an orchestra—simultaneously listening and leading in order to maximize performance. Mike Shapiro, Founder and CEO of The Alternative Press, is operating a company with high growth potential, falling somewhere in between a typical main street business and a Google or AOL. Where they land on the continuum of opportunity remains to be seen, and will likely depend on their abilities when it comes to raising capital now and again in the future. After investing $100,000 of his own money and forgoing a salary for two years, the time came for major expansion. “A founder wearing many hats only gets you so far,” says Mike. Unlike many businesses at this point in their life cycle, Mike’s business is revenue positive—meaning they pay all their bills with incoming revenue and have a bit left over to spare. For many (if not most), keeping the lights on is what usually drives a startup to raise investment capital. 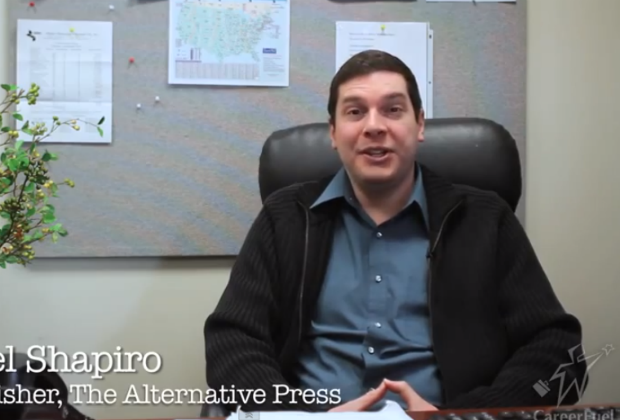 The Alternative Press is an online local news business that sells licenses to local entrepreneurs who then run their own local news business while the infrastructure is covered by the corporate parent. Having tested the licensing model in 10 markets, the natural next step was scaling the business in 100+ more markets. This would require raising money—ideally $1 million. Even if the business qualified for a bank loan, Mike worried that repaying the loan would limit his investments in critical areas like sales, marketing and infrastructure. Instead, he decided to call on accredited investors–people who meet certain wealth and annual income requirements– to invest some of their money in his company in exchange for equity. Two choices are possible: angel investors or venture capitalists. Angel investors are a better match when raising a first round of capital, as venture capitalists invest only 3% of their money in early-stage companies (as opposed to later-stage startups, which receive the majority of VC funding). Individual Angel investments tend to be smaller, requiring more of them to complete a fundraising round, but returns can be sizable. For example, Nick Hanauer, a Seattle businessman, invested $40,000 in Amazon.com– his investment was valued at $250 million at one point. Mike opted to pursue angel investors via a private placement known as a REG D 504 offering. He could also have created a campaign on AngelList or Gust, two popular web-based platforms where angel investors can evaluate numerous investment opportunities. Once The Securities and Exchange Commission completes the regulations for the JOBS Act, equity crowdfunding will also be an option. Mike worked over a three month period with a securities attorney, accountant and his new Chairman, Jim Lonergan, a seasoned executive who ran successful media companies including TheStreet.com. In concert with these advisers, he developed a business plan, presentation deck, and an offering document. Now he is working his network to identify accredited investors and meet with them in hopes that they will write a check. *Many people, while qualified financially, are not involved much with private investing, thus it takes time to absorb the opportunity. *It is necessary to speak, meet, and go through the business model/financials before investors can get comfortable committing– more so than they had previously thought. Thus far, Mike and TheAlternativePress.com have verbal commitments for $250,000 and they hope to close this fundraising round by the end of the first quarter. Mike is finding that about 25% of his time is spent on fundraising and he is constantly improving his pitch after each meeting as he listens attentively to investor questions. Assuming they raise $1 million, allowing The Alternative Press to further prove the license business model, grow the business per the plan, generate positive EBITDA and cash flow post-investment, Mike anticipates another fundraising round in 18 months. The second round would enable them to expand across the US quicker than cash flow would otherwise allow. In this entrepreneurial symphony, Mike is in the first movement. How it builds and harmonizes is being written as you read this. Whether it becomes famous for its success and studied by many is for time to tell, but I would say it sounds promising. Read Anatomy of a Startup—Part I.